Derbyshire Fire & Rescue Service reports that at 05:22 on the morning of Friday 9th June they were called to a fire at a factory involved in the production of cardboard packaging in Clay Cross. Two appliances from the local fire station attended. An officer from Derbyshire F&RS reported….. 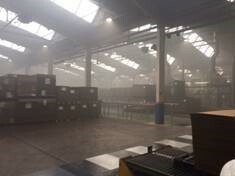 The photo below gives some indication of the potential for the fire to take hold in the premises. This entry was posted on Wednesday, June 14th, 2017 at 4:10 pm and is filed under Fire Sprinkler Industry News, Fire Sprinkler Stops. You can follow any responses to this entry through the RSS 2.0 feed. Both comments and pings are currently closed.